Evangeline Lilly Is Back in "The Hobbit"
Evangeline Lilly in "The Hobbit"
If anyone’s going to conjure up a new character out of whole cloth to fit seamlessly into the world created by author J.R.R. Tolkien, it would be filmmaker Peter Jackson. Jackson, the man behind the film adaptation of “The Lord of the Rings” trilogy and the three Hobbit prequels, would’ve earned a little trust from the fanbase. But he and his collaborators had to prove that the Woodland Elf Tauriel was worthy – not just to audiences, but also to Evangeline Lilly, the actress who plays her. 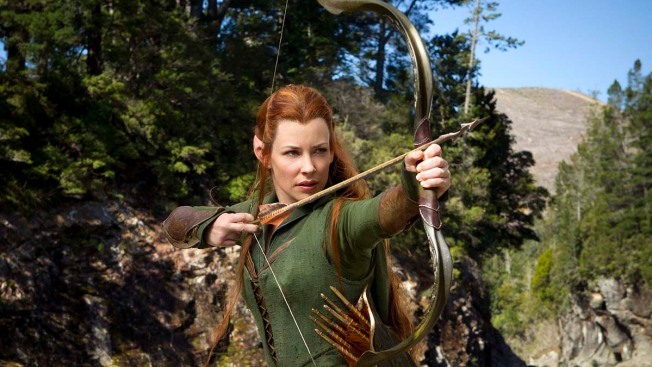 Tauriel – the feisty female captain of the Mirkwood Forest ‘s Elven guard, who at a mere 600 years old is a less advanced elf than previously seen in the franchise – was conceived by Jackson and his story and screenplay collaborators Fran Walsh (Jackson’s wife) and Philippa Boyens as a means of both opening up the universe and introducing a woman into the male-dominated cast of characters. The Wooldland Elves who appear in "The Hobbit" novel are nameless, undeveloped characters. So the filmmakers drew upon references from appendices appearing in Tolkien’s later works to flesh out roles like Lee Pace’s elf king Thranduil, incorporate Orlando Bloom’s “Rings” role as Legolas into to the story to help bridge the two trilogies, and finally craft Tauriel largely as an entry point for female fans. “So you've got material there, but you don't have a scene in a film that's memorable,” says Jackson. To realize their vision of Tauriel – a more reckless and impulsive elf than previously seen, and one who finds herself at the center of unexpected romance – Jackson thought of Lilly, impressed by her work on the television series “LOST” as the enigmatic, independent Kate Austen. But Lilly proved an elusive quarry, having largely retreated from Hollywood after “LOST” concluded. The filmmakers also wanted to explore Tauriel’s emotional life. “I remember that moment where I said, 'And this is a love story,'” recalls Boyens as she pitched the premise to Lilly. “'It's not a conventional love story…It’s with a dwarf.' And there was a silence.” But as Boyens revealed that a romantic spark would ignite between Tauriel and Kili, a member of Thorin Oakenshield’s dwarvish followers played by Aidan Turner, the actress was quickly swayed. “That was a ‘whoops’ moment,” says Boyens after re-conceiving the character dynamics to add hints of deeper feeling toward Tauriel from Legolas. “What happened was when we saw it playing, that first exchange of looks between Kili and Legolas, was just kind of perfect…Legolas hates dwarves in ‘The Fellowship of the Rings.’ This is animosity. That had to come from somewhere." The athletic actress also had to dedicate herself to a challenging training regimen, having allowed herself a relaxing stretch of time away from strict workouts after becoming a mother. “I was not in as good shape as I would liked to have been,” she admits.